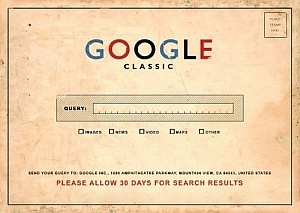 Since the start of Google+ in June 2011, a lot has changed in the social media landscape. Facebook is still the most used platform, XING is the recruiting source nr. 1 and Pinterest is the most used online photo album. But how does Google+ integrate itself here? Google CEO Sergey Brin announced last week that he regrets how much Smartphones stop us really taking note of our fellow man. According to him, this will all be different with Google Glass. Far from it, it is more likely to get worse. As you can see in this video, a short attention span in combination with augmented reality and voice control ruins every date more thoroughly than a smartphone ever could. We wonder if the makers of this video were chosen as Glass Explorers (exclusive testers of the glasses). Maybe Google is showing a sense of humor, after all, this is one of the better contributions under the keyword #ifihadglass handed in to Google in the past weeks. Through the integration of an e-commerce system, the way to new customer acquisition stands open for B2B marketers via online marketing. As long as the product data isn’t only visible to a closed user groups, the online shop can be optimised according to all SEO rules, assuring better rankings. Is German B2B Supply also Missing the Boat? The price competition which is normal for every competing trader at Amazon, is also part of life for manufactures and the industry. Those who offer exclusive and complex products as well as the fitting logistics can relax for a bit. Everyone else has to watch Amazon’s supply catalogue grow and thrive, invariably ruining their prices. Strangely, considering the B2B market is decidedly larger than the B2C market, there are comparatively few statistics for B2B e-commerce. Strictly speaking, B2B e-commerce accounts for over 95 percent of the entire e-commerce market volume and generates 870 billion euros turn over. This becomes less surprising, when one realises that B2B generate only one percent of this turnover online. These are the results of the IFH study B2B E-Commerce Markt in Deutschland 2013, which used statistics from 2012. The Otto group clean up continues: as was announced in yesterday’s customer newsletter, 3suisses is closing operations in Germany after all. The distributers of French fashion have been going badly for a while now. Over the past year, the Otto group, which has had up to 51 percent of the company since 1981, made a take-over offer to stop the downward spiral. The company take over bore fruit: e-commerce and service companies of the enterprise group have belonged to Otto since January 2014. 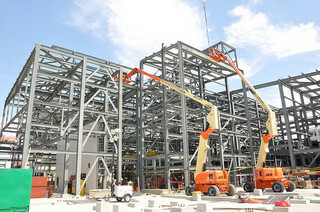 They take part in the usual activities from the area of financial services, real estate, and B2B trade. 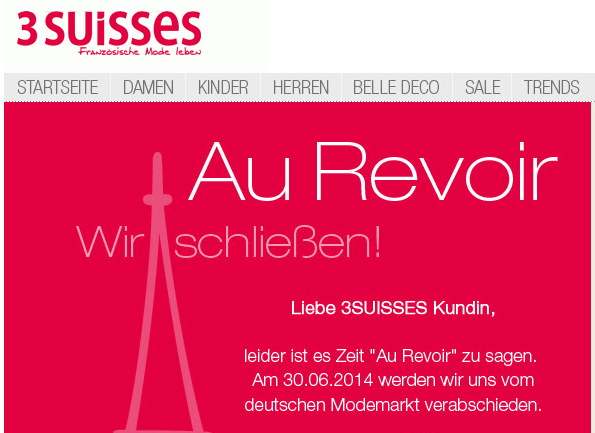 It seems that nothing came of the recue plans, and 3SUISSES left the German market on the 30.06.2014. Personalisation is the most effective promotional measure, and the most important investment topic in e-commerce. Nearly every online shop uses product recommendations, which take the interests of the user into account. True to the motto >>Recommendation is the New Search<< today’s shop visitors don’t want to look for a specific product, they want to be found by the right product. So the woman of tomorrow talks about fashion with a shop assistant via a telephone-integrated screen (the internet?). Curated Shopping sends its greetings. The topic – same day delivery – is also to be seen: delivery takes place via rocket. Even back then it was clear that the people of the future would want to have their order delivered as quickly as possible.